Submitted by Mason Hoberg on Jun. 22, 2017. A capo is a must-have accessory for any guitarist. The ability to play different chords in a variety of positions (for example, playing a C chord with a capo on the second fret makes it a D chord) is an invaluable asset to any vocalist or finger-style musician. However, there are a ton of different capos available. This makes finding the best capo for your needs a little bit of a challenge. 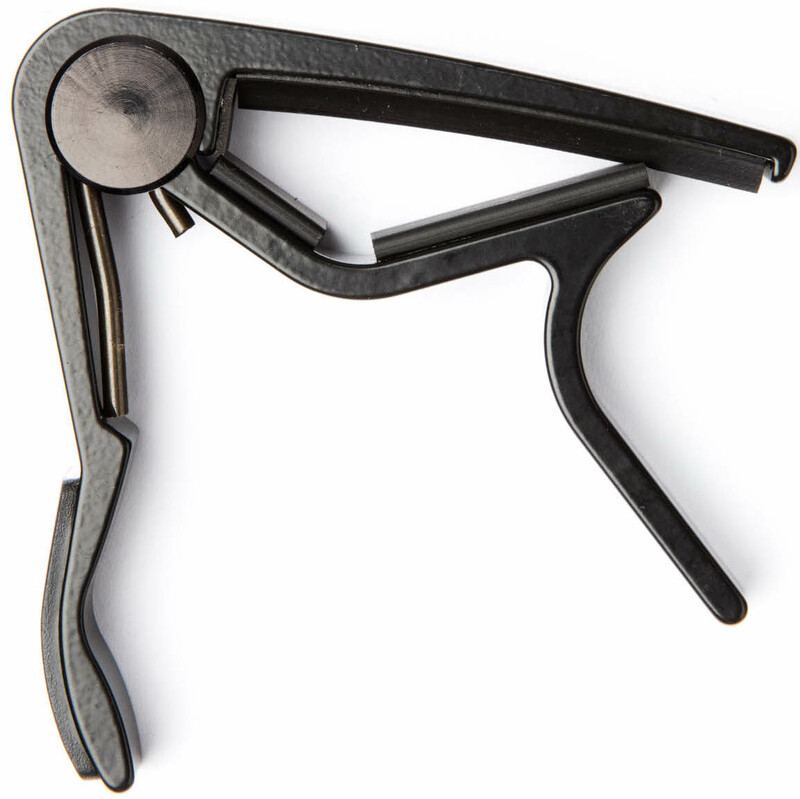 If you’re looking for the best guitar capo, don’t go in blind! If you’re still not sure which capo is right for you after reading our recommendations, jump to the end of the article where we’ll give you all the info you need to make an informed purchase. The capos below are all quality additions to any musician’s arsenal. Each of these come with their own pros and cons, so be sure to read through each listing carefully before you make a decision. If you’re unable to make a final decision after reading through the recommendations, check out the section “Things to Consider Before You Buy A Capo” which will help give you more information on what type of capo will work best for a given situation. 96 out of 100. Incorporating 2300+ ratings and reviews. 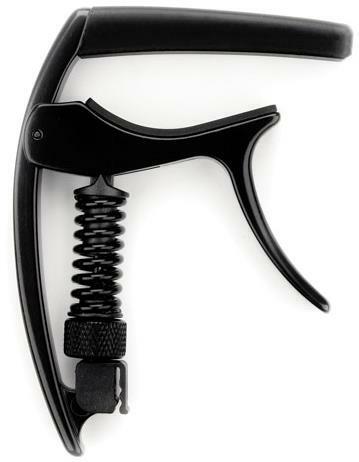 Shubb is an innovator in its industry, because their capos were among the first c-clamp capos to approach the level of usability found in a trigger style capo. This model has been widely adopted because of its simplicity and reliability. Because of the design the potential exists that if you’re not careful while using this capo you may scratch the finish of your guitar’s neck. 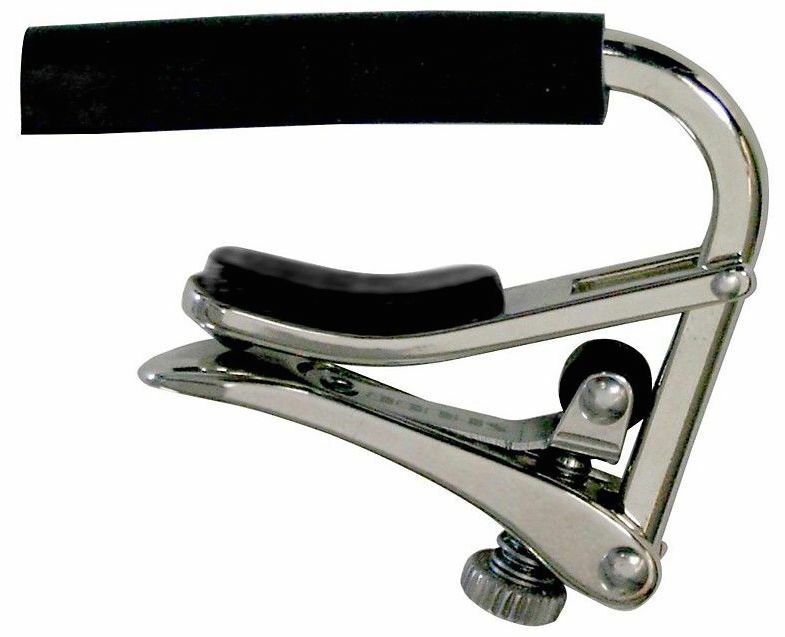 The main selling point of this capo is its variable tension mechanism, which helps to reduce the possibility of needing to re-tune when using it. A draw-back with the design is that it requires two hands to operate, which makes it inconvenient to move mid-set when compared to a trigger style capo. Currently, there isn’t much difference between Shubb’s Standard and Deluxe series. The Deluxe is made from steel while the Standard is made of nickel-plated brass. The Deluxe is also made in America. Apart from that, the two capos are exactly the same. The Standard series used to use a pointed piece of plastic to tighten the capo against the neck, and the Deluxe was introduced at a later time and used a wheeled mechanism. Because the wheel created such an improvement in performance Shubb introduced the wheel mechanism into the Standard Series. The only benefit that the Deluxe series has over the Standard series is that it won’t be scratched as easily because steel is more durable than nickel. 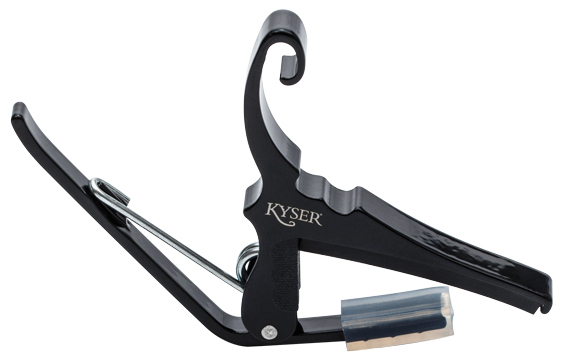 Kyser capos are ubiquitous due to their affordability and how easy they are to find. While the design is incredibly simple, Kyser capos are highly regarded for their overall usability. The only real draw-back in this design is that, like other trigger capos you can’t adjust the tension. This is less of an issue with 6-string instruments, because the added tension has less strings to affect. However, with 12-string instruments tuning issues are more noticeable. The only difference between a 6 and 12-string capo is that a 12-string capo applies tension across a wider surface area and applies more force. While you can use a 6-string capo on a 12-string instrument, it probably won’t have enough tension to allow the strings to ring out clearly. A 12-string capo will likely put too much force for a 6-string instrument, causing the strings to go out of tune. 93 out of 100. Incorporating 1650+ ratings and reviews. This capo is a great fit for younger musicians or those suffering from arthritis because it has a padded handle and an ergonomic shape. This helps to make the capo easier to position because you get more leverage when using it and the padded handle helps to reduce strain on your hand. However, there are a couple concerns with this capo. First, the capo bills itself as being for both 6 and 12-string instruments. While we all wish that we could find a one-size-fits-all capo, in all reality there’s a reason that there are separate capos for 6 and 12-string instruments. A 12-string guitar just requires more pressure than a 6-string guitar, and when you use a 12-string capo on a 6-string guitar it can make your guitar sound out of tune. There are a few reports of this capo exerting too much pressure, though to be fair this complaint isn’t present in every review. Second, there are a lot of people selling counterfeits of this capo on various online retailers. So if you do choose to go with this capo be sure to verify that it’s an actual Jim Dunlop product or buy from a reputable seller - we've linked to the legitimate version here. 92 out of 100. Incorporating 950+ ratings and reviews. 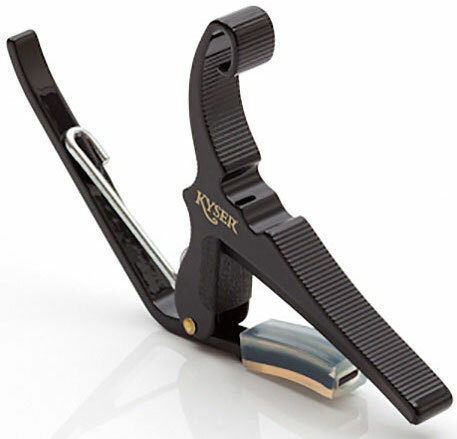 Like the other Kyser capo on this list, the Kyser Quick-Change capo is a great fit for the musician looking for an easy-to-use option. C-clamp capos are great for their flexibility, but dialing in the perfect tension can be a pain. Another advantage of this capo is that when it’s not in use you can clamp it onto your headstock (which won’t damage the finish on most instruments) which is convenient if you place and remove your capo multiple times throughout a performance or practice session. The D’Addario Planet Waves NS Capo Pro is a c-clamp/variable tension style capo that’s intended to be used on guitars with radiused fretboards (fretboards that are curved). To place the capo you slide it onto the neck and tighten the mechanism, and to remove it you loosen the thumbscrew. The best part about this capo is that you can adjust the tension it exerts on the neck, so you’re less likely to have to re-tune when using it. A potential draw-back with this capo is that there isn’t a quick-release mechanism, so removing the capo will take longer than it would with either a trigger-style capo or one that does include a quick-release mechanism. The D’Addario Planet Waves NS Tri-Action Capo combines the usability of a trigger-style capo with the control of a c-clamp capo. To place and release the capo you grab the trigger portion, and to control the tension you turn the thumbscrew on the bottom. Like other trigger-style capos, you can also clip the capo to the headstock when it isn’t in use. While it combines the best parts of trigger and c-clamp style capos, it’s main issue is that the thumbscrew has a limited range of tension when compared to a true c-clamp style capo. If you use thicker gauge strings or a 12-string guitar you may find that this capo doesn’t have the tension necessary to produce a clear tone, but other than that it has high ratings for a reason. 89 out of 100. Incorporating 450+ ratings and reviews. 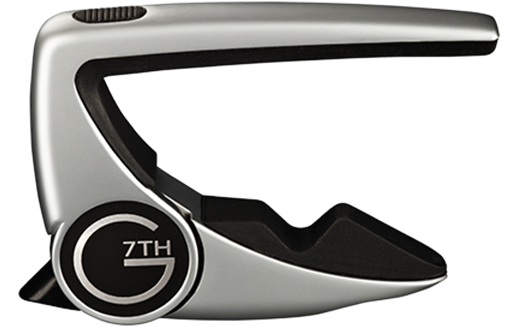 The G7th Performance 2 Capo is easily the most intuitive capo on this list. To tighten it, all you do is grip the capo and squeeze it. This feature removes the need to fiddle with it in order to get a good tone. To release the capo, all you have to do is push against the release mechanism (the black lever on the back of the capo). Unlike a lot of capos with a variable tension mechanism, these two features allow you to operate the capo single-handedly. However, there are many reports of this capo not having enough tension to properly press down the strings when used on guitars with thicker gauge strings or vintage (thicker and wider) neck profiles. With that being said, the possibility does exist that the musicians who had this experience didn’t use the proper model. Currently, the G7th Performance 2 comes in three variations: 6-string guitar, classical guitar, and 7.25” Vintage radius (this is the 6-string model). So before purchasing this capo, make sure you’re buying the correct model for your instrument. Another feature that differentiates this capo from many of its competitors is that it comes with a lifetime warranty, which helps to offset its initial cost. It’s still more expensive than other capos, but should it happen to fail you can get a replacement for free. To find the best guitar capo there’s a few things you’re going to need to know. The sections below outline some of the key things to keep in mind before you make a purchase. We would encourage you to refer back to this part of the article before you make a final purchase to ensure you have a rough idea of how your capo will perform. There are three main types of capos you’re going to run across: trigger/spring-loaded, c-clamp/variable tension, and partial. Each type of capo has its own pros and cons, so it’s important to know the difference between them before you commit to buying anything. Trigger capos are the most popular type of capo. You open the capo by squeezing the trigger portion (which compresses the spring), and then when you release the trigger the spring extends and maintains the capo’s tension. These capos are really easy to use, because all you have to do is squeeze the trigger mechanism to remove and place it. Because they’re so simple, they’re arguably the best capo for beginners. However, unlike c-clamp capos you can’t adjust the tension. If the capo is too tight it will make your guitar sound out of tune, and if it’s too loose it will make your strings buzz. 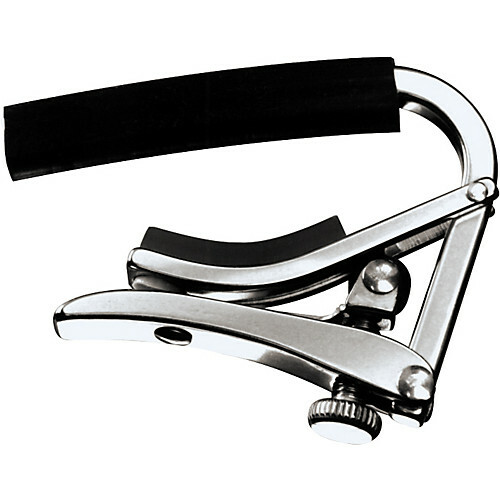 With C-Clamp/Variable Tension capos you manually adjust the tension by turning a thumbscrew. The cool thing about these capos is that you can adjust the tension for your instrument, so you generally won’t have to re-tune when you use it (again, this depends on the guitar). These capos generally have a quick release mechanism to release the capo from the neck, though they’re still a bit harder to put on/take off than a trigger capo. A good example of this type of capo would be those made by Shubb. Another benefit of this type of capo is that it’s easy to use with a nylon string or electric guitar, because you can dial in a tension appropriate for the strings you’re using. Many trigger style capos are intended for acoustic guitar, so they exert too much pressure for nylon or (most) electric strings. Partial capos only cover some strings on an instrument. They’re commonly used by finger-style guitarists to change the notes they can play in the bassline of a piece. These capos aren’t as practical as the other two options, but they’re a good addition to your collection of gear if you’re a finger-style musician. Is There Any Reason to Buy an Expensive Capo? This is just a personal opinion so take it as you will, but I don’t think you really don’t need to drop a lot of cash to get a good capo. You can get a perfectly functional capo for around $15 (the Dunlop 83CB capo above is a perfect example of this). When you buy an expensive capo, you’re generally paying for tone retention and a moderate reduction in tuning issues. Capos have a tendency to somewhat reduce the tone of a guitar because they dampen the vibration of strings. However, the difference between a high-end capo and an entry-level one isn’t dramatic enough to justify the increased cost for most beginning musicians. We examined all the widely available and popular capos available at major American music gear stores. We then gathered relevant reviews, ratings, videos, and forum comments that discuss them. We added the 17 most promising capos to our Music Gear Database for detailed analysis. We took the information we had gathered from more than 9,100 sources, and processed it with the Gearank Algorithm to produce ratings out of 100 and selected the highest rated ones to recommend above. For more information about this process see How Gearank Works. Submitted by Ross (not verified) on Jun. 27, 2017. I got the G7th, but the Newport model a few months back and it works great - can't speak to the Performance 2. Using on a Yamaha acoustic. Submitted by Jim Tull (not verified) on Jun. 12, 2018. Hey, you guys missed the best capo made: the Phil Elliott Elite. Nothing comes close to its compactness, workmanship and ability to hug the fret. Submitted by Jason Horton on Jun. 12, 2018. We didn't miss Elliott Capos, they didn't meet our availability criteria as listed in the Methodology section above. For the most part, we don't include boutique brands in our guides, however we'll take your suggestion on-board and we may expand the eligibility criteria when we next revise this category.